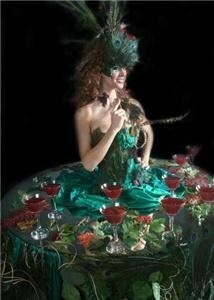 Our beautifully costumed Strolling Tables will be the hit of your next event! Our actors mingle with your guests while serving drinks, hors d'oeuvres, handing out brochures, samples or giveaways. For your next Trade Show, Convention Booth or Bridal Faire leave it to us to demonstrate your product and answer questions all while being mobile and reaching out to where the clients are. It's not every day people see a Human Table and it's a sure bet to catch their eye!